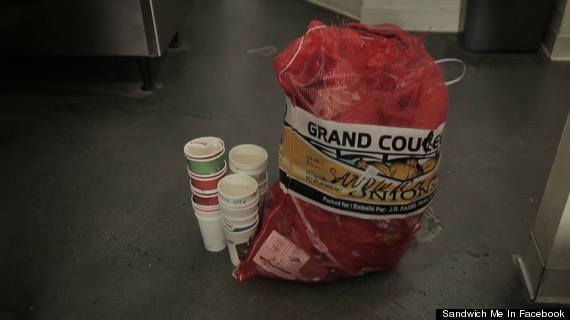 A restaurant owner in Chicago who hasn't emptied the trash in nearly two years has a simple explanation: There isn't anything to take out. Justin Vrany, 36, had the goal of being a "zero waste" restaurant in mind from the day he first opened his quick-service eatery, Sandwich Me In. Two years in, Vraney's remarkable efforts are the subject of a new short film, above, produced by NationSwell. Since Sandwich Me In opened its doors, its entire waste output is equivalent to what a restaurant of similar volume produces in just an hour, Vraney told HuffPost. The bulk of the trash Vraney has dealt with didn't even come from the restaurant, but largely from customers carrying in items like plastic-lined paper Starbucks cups. Just one reusable drawstring bag holds nearly two year's worth of waste from Sandwich Me In. "If I can do this with a quick service restaurant, I hope I can help other restaurants do that, too," Vraney said. To achieve the goal of zero waste, the restaurant runs on sustainable energy, with food coming minimally packaged from local farms. Virtually everything -- from food scraps to spent frying oil -- is reused or repurposed. "I practice the five R's,' Vraney said, referring to the environmentalist's credo of reducing, reusing and recycling. Vrany adds "Reject" and "Refuse" to his list, drawing a firm line against outdoor waste like junk mail and excessive packaging. Vraney, who runs his household in a similarly zero-waste fashion, said that though food is his passion, he's working hard to be waste-free for the sake of his children. "I have kids, and their future -- they're not going to be able to live the way I lived," Vraney said referring to the increasingly grim outlook on climate change. "I want to see [my kids] live the same life that I had. I don't want to risk it, I'm not a gambler. I want to to take care of the things I love the most." Vraney admits that achieving zero waste wasn't without challenges: He spent a frantic six months of the restaurant's early days working the entire operation by himself to keep labor costs low and has eschewed time-saving conveniences like pre-packaged broth; instead, he makes his own from the bones of the chickens he uses. In a scant two years, Vrany says he's turned a small profit. "For me it's not a money issue. I'm looking at this more widespread. If I don't do this now, it's not going to be done. It can be done, and it can be done for reasonable prices." Vrany says the restaurant's food costs are "really low" since none of it is wasted. Menu items are intentionally planned to intersect. “The crispy smoked skins of the chicken go onto the Cobb salad and the chicken bones make the broth for the chicken soup,” Vraney told Truth Atlas, which first reported on his zero-waste efforts. Leftover veggies from one day go into a burger the following day and even food scraps are given to farmers to feed the chickens that produce eggs for the business. Vraney was pleased with an unintended result of using fresh, local, unprocessed produce: No food comas. "Customers come in and they eat a reasonably-sized portion, and when they're done they still feel like they have energy. They feel good." As for the eight gallons of waste, Vraney is finally ready to let it go. An artist who makes sculptures out of refuse recently came in to take the trash, which will soon become a new piece of art.